Blog – Rich Russo - The King of Free Form Radio. Posted on Dec 13, 2017 by Rich — Blog — Add your take! Just gutted about the passing of Pat Dinizio of the Smithereens, such a great talent and wonderful guy. Pat, Jim and Dennis appeared on my show in 2011, did 3 live songs and an interview, here’s all of it for you to watch, it’s really great stuff..
Posted on Aug 07, 2016 by Rich — Blog, Playlists — Add your take! Posted on Apr 27, 2016 by Rich — Blog — Add your take! 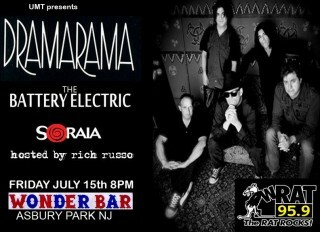 I received an email from a long time listener of my radio show who lives about an hour outside of Asbury Park and when she went to purchase tickets online for Dramarama on July 15th, she was caught off guard that her tix which had a face value of $20 each, cost $29 each after a $9 fee on each. She didn’t buy the tickets. I don’t blame her. A 45% service charge is ridiculous and just not right. I checked other shows at the venue via Ticketmaster and most of them had a fee of 25%, which is still ridiculous to a degree but not as insane as 45%. I then found 2 other shows at the venue that had similar 45% fees, the common thread is that they are all $20 ticket shows, so it seems that if the show is $20 the fee is 45%, if it’s $15, the fee is 25%. Whatever, it makes zero sense to me. 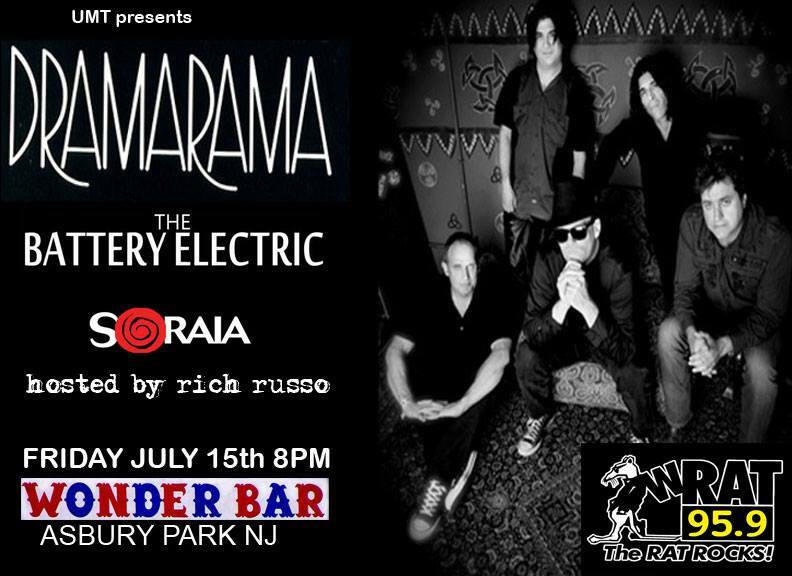 I also want to make clear that NONE of that 45% fee on tix to the Dramarama show goes to the bands or the promoter or your host for the evening (who by the way is doing this show for free, so the bands can make more). I’d much rather you take that $9 fee and use it to buy the new Battery Electric CD at show, or a Soraia CD or T-Shirt, or even a Dramarama T-shirt (yes folks, finally Dramarama merch at a show), or buy a drink for someone with it, or some food, or give to a worthy charity. But you may ask, how do I still get to see the show and avoid that ridiculous 45% fee, while not getting shut out at the door the night of the show as it’s sold out every year for the last 7 years? There are two ways to do that: you can buy the tickets in person at the Stone Pony Box office which only has $3 fee for the tickets which is much more reasonable. But I realize that some of you aren’t near the Pony, and that getting there to save $6 may not make much sense with gas and tolls and time, if you aren’t already down there for something else. So I’ll offer you this solution, I personally will go to Asbury and secure the tix for you, all you need to do is send me an email (rich@richrusso.net) or message me via Facebook, and I’ll give you the info on how to pay me via paypal and I’ll go get your tix for $23 each, and they will given to you the night of the show. I apologize again for the ridiculous 45% fee via online ordering, and hopefully you’ll take me up on my offer above. Posted on Oct 04, 2015 by Rich — Blog, Featured, News, Playlists — Add your take! Posted on Sep 12, 2015 by Rich — Blog — Add your take! Posted on Aug 29, 2015 by Rich — Blog — Add your take! Posted on Aug 15, 2015 by Rich — Blog — Add your take! Posted on Jul 11, 2015 by Rich — Blog — Add your take! Posted on Jun 27, 2015 by Rich — Blog — Add your take!